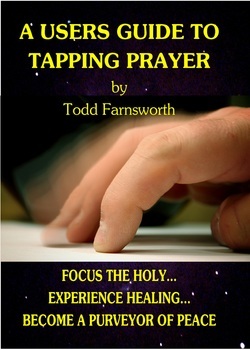 A USER'S GUIDE TO TAPPING PRAYER is the Beginner's Bible for folks interested in getting started with Tapping Prayer. Tapping is an activity that many of us engage in everyday without even thinking about what we are doing. We drum our fingers on a desk or table while we wait for something to happen. We tap our forehead while we are figuring out a problem. We stroke our chin or rub our head as we contemplate the issues of the day. Each of these acts is our body’s clumsy way of attending to a need for peace or resolution. Tapping prayer is a spiritual practice that intentionally focuses our attention on the rhythmic movement of our finger tips. It directs the energy of God’s healing onto specific points on our body that through the practice of acupuncture and reiki, have shown to be conduits of healing. Tapping prayer is the most exciting addition to my spiritual tool belt in 25 years of ministry. It’s fun and effective and easy to administer alone, one on one, or in a group. It is very flexible...and did I mention, effective? Tapping prayer is effective in bringing individuals into a one one relationship with God that creates peace, healing, and a desire to share those gifts with other individuals, communities, and Creation. Tapping prayer is an integration of sacred wisdom from the East and West. It is a spiritual practice that blends a knowledge of the Spirit’s movement through our body with an understanding of meridian tapping based on the Emotional Freedom Technique created by Gary Craig. Tapping prayer brings balance and peace to individuals who are experiencing spiritual distress. By gently tapping on identified points of entry for the Holy which correspond to meridian end points in acupuncture, while praying for God to attend to a particular pain, we focus God's intention to heal and in most cases actually experience a peace which is not of our own doing. Approximately 20% of veterans returning home from war experience either Post Traumatic Stress, Moral Injury, Complicated Grief, or some combination of the three. Faith communities are uniquely positioned to bring healing to these distressing conditions. 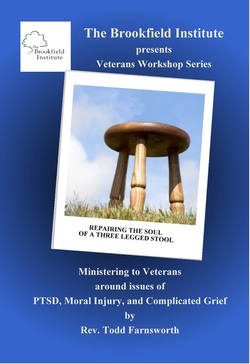 Repairing the Soul of a Three Legged Stool is a three part series of workshops presented at The Brookfield Institute (brookfieldinstitute.org), in MA during the summer of 2013. Rev. Todd Farnsworth leads participants through exploring how each of the aforementioned conditions effects a soldier returning home from war. Traditional and cutting edge models (including tapping prayer!) of treatment are discussed and demonstrated so that the reader can quickly begin to bring healing to his/her community.